This page will take a look at South Africa's inbound tourism numbers as well as income earned from the Tourism industry in South Africa. It aims to answer the question, where does South Africa's tourists come from and where and what type of accommodation do they use when they are in South Africa. 14 March 2019: How do tourists spend their money? In this update we take a look at a article published by Statistics South Africa regarding what tourists both domestic and international spend their money on. ​Fancy a meal out, or would you rather save up for accommodation when on holiday? We take a peek into the spending habits of domestic and international visitors who criss-cross the South African landscape. Visitors spent just over half a million rand every minute during the course of 2017! That amounts to R277 billion for the entire year, according to the latest Tourism Satellite Account for South Africa report. Domestic visitors were the biggest spenders, pumping R156 billion (or 56%) into the economy, while international visitors contributed the remaining R121 billion (or 44%). 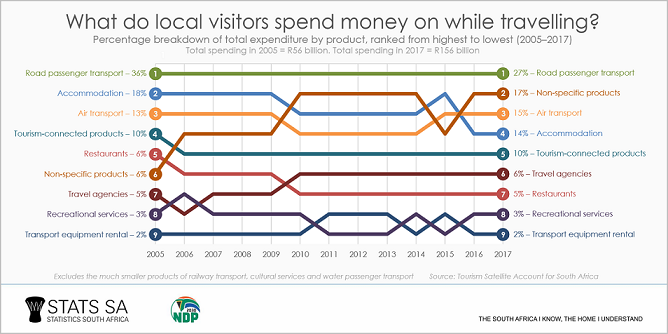 A little digging into domestic visitor expenditure reveals that local explorers focused their spending on road passenger transportation (taking up 27% of the R156 billion), followed by non-specific products. These are products that visitors buy that are not specifically related to tourism-characteristic activities. Retail (‘shopping’) products fall into this category. Air transport was ranked as the 3rd most important item in the domestic visitor’s budget, contributing 15% to total spending in 2017 (click on the image to enlarge). The beautiful thing about this analysis is that annual data are available from as far back as 2005, showing how domestic visitors have shifted their habits over time. Road passenger transportation was also ranked #1 in 2005, but this item took up 36% of total domestic expenditure then, higher than the 27% recorded in 2017. Accommodation was the second-most important item in 2005, falling to 4th place in 2017. The major mover, however, was non-specific products, shifting from 6th place in 2005 to 2nd spot in 2017. Non-resident visitors gracing our shores have slightly different spending priorities. The major spending item for international visitors is non-specific products, followed by accommodation and tourism-connected products.5 Road passenger transportation was the fourth-most important expenditure item. The spending habits of international visitors have remained more stable over time, with little change happening from 2005 to 2017.So next time you pack the car or board a plane to go exploring our country on holiday, take pride in the fact that you are making an important contribution to our economy. The bar chart below shows the top 30 countries from which South Africa received holiday tourist numbers for December 2018 (African countries are excluded from this analysis). Added to that we take a look at those same countries and how many people came to South Africa from these countries during December 2018 to do business. But good luck with that as the majority of South Africans switch off during the month of December and take things easy and unwind during the last month of the year. Surprisingly the bulk of the inbound tourists arriving in South Africa for holiday purposes arrived from the United Kingdom (take the lead from the main supplier of tourists to South Africa, Germany). Even more surprising is the fact that the USA supplied the second most number of inbound tourists arriving in South Africa for holiday purposes. Germany came in, in third spot. Below a summary of the Top 30 countries as well as the number of tourists that arrived for holiday purposes during December 2018. The UK, USA and Germany remain in the top 3 spots when looking at the business travelers that arrived from these 30 countries during December 2018. While India is 9th on the list in terms of tourists arriving for holiday purposes they are 4th on the list in terms of number of people arriving for business purposes. China is 13th on the list of top 30 countries who supplied tourists for holiday purposes during December 2018, but is 5th on the list of countries who supplied tourists arriving for business purposes. In this update we take a look at the inbound and outbound tourism numbers between South Africa and Australia. While Statistics South Africa collects and published inbound tourist numbers (tourists coming into the country), they do not publish numbers on South African tourists leaving the country and where they are heading. Luckily for us, the Australian Bureau of Statistics (ABS) collects numbers on their inbound tourist, from which we can see how many South Africans head to Australia for tourist purposes. 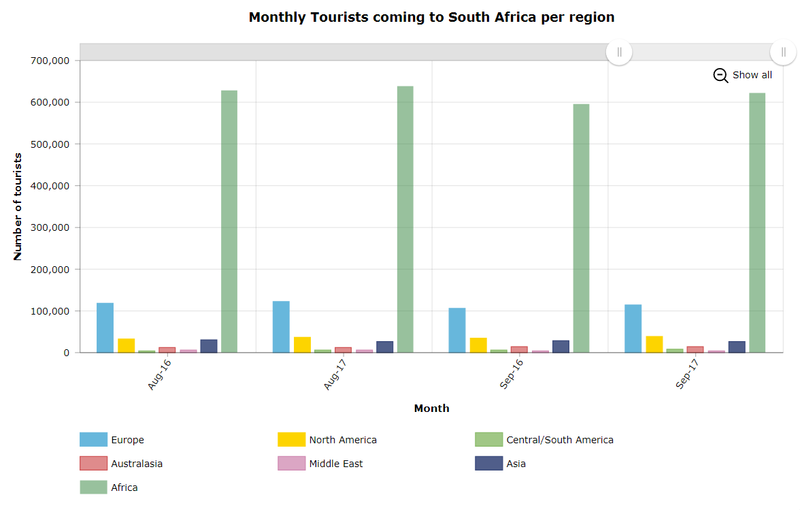 The graphic below compares the number of tourists from South Africa heading to Australia per month to the number of tourists from Australia heading to South Africa each month. And even though the Australian population is far smaller than that of South Africa, their tourism numbers coming into South Africa is far greater than South African tourists heading to Australia. Perhaps one of the clearest signs of the difference in wealth and overall living standards between the two countries, as the average Australian has far greater means at his/her disposal to allow travel. Even though South Africa's population is far greater than that of Australia, the number of people that can afford travel is far less. One does see a massive spike in the number of tourists from both countries during the month of December for the year end holidays, especially for South Africans heading to Australia. 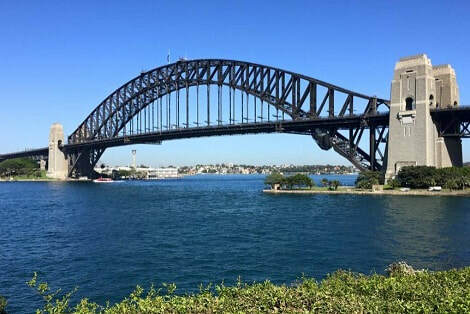 No doubt a large number of these tourists head to Australia to see famous sites such as the Sydney harbour bridege, the Opera house, Bondi Beach, Great barrier reef and of course a lot of South Africans head to Australia each year to see expat South Africans living in Australia. The graphic below shows the occupancy rates recorded by the various accommodation types as well as the Total Industry occupancy rate achieved per year for the last 12 years. From the above graphic it is clear that "Öther" and "Guest houses and guest farms " consistently achieve occupancy rates above the total industry average. While the occupancy rate for Caravan parks and camping sites are by far the lowest of the different types, it has seen a massive surge in rates in recent years (as consumers struggle and cut back on expenses and go for cheaper holidays that Caravan Parks and camp sites provide). For those wondering what "Other" includes, it includes self-catering units, bed-and breakfasts, lodges an other accomodation not covered by any of the accommodation types. "Other" accommodation has by far the highest occupancy so far in 2018, and has been the leading accommodation type in terms of occupancy rates from 2014. Interestingly that over the last 12 years, the overall total industry occupancy rate hardly changed, except a slight dip in occupancy rates from 2010 to 2012, thanks to the recession set on by the financial crisis in the USA. South African consumers opted for "stay cations" or stay at home vacations in order to save money during tough economic times. In today's update of our Tourism page we take a look at some of the numbers published by Statistics South Africa in their Tourism Satellite accounts data. We often hear that Tourism makes up a significant part of South Africa's economy, and that it is targeted by government as one of the major industries for future economic growth of South Africa (however with extremely and persistently high crime levels we not sure how they plan to make that work). 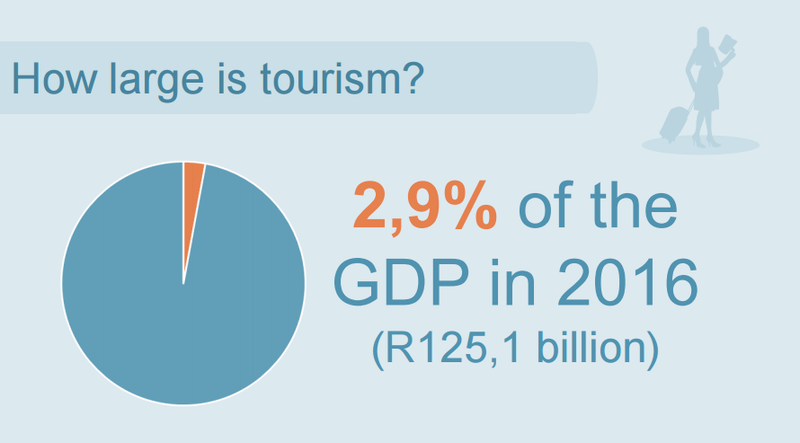 Nonetheless, numbers from Stats SA shows that Tourism contributed 2.9% to South Africa's economy. That is bigger than the whole agricultural sector in South Africa as the agricultural sector contributes roughly 2.5% to South Africa's economy. Tourism is also mooted as a potential sector where large scale employment can be created for South Africans. 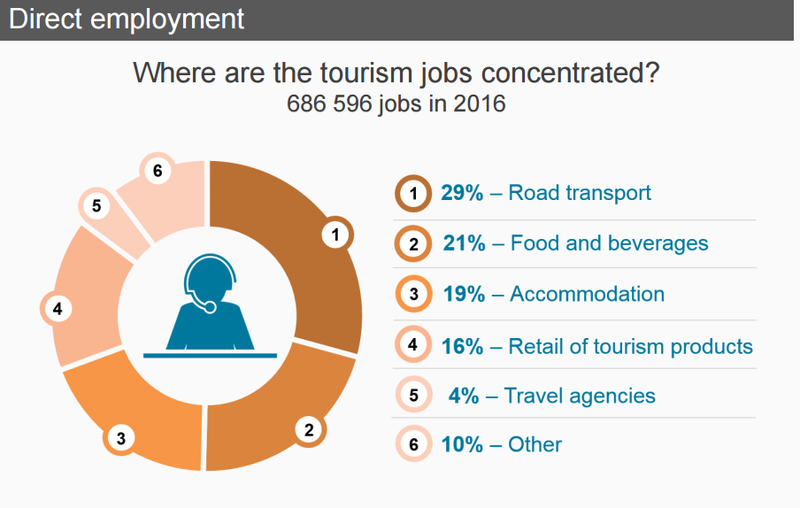 So the question is just how many people are currently working in tourist related sectors and how much does that make up of South Africa's total employment levels? 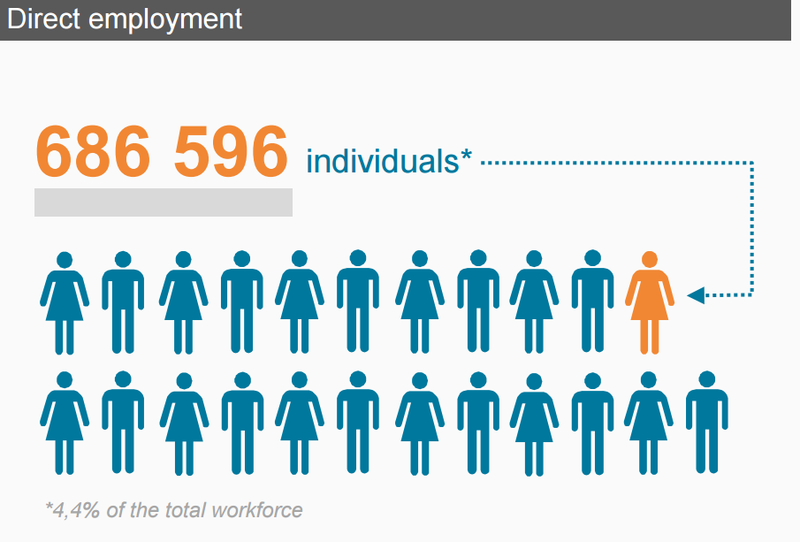 As the graphic above shows in 2016, 686 596 individuals were working in the tourist related sector, and this almost 687 000 individuals made up 4.4% of South Africa's total work force. So in which parts of the tourism industry does the 687 000 people work? See image below for graphical representation of the above. 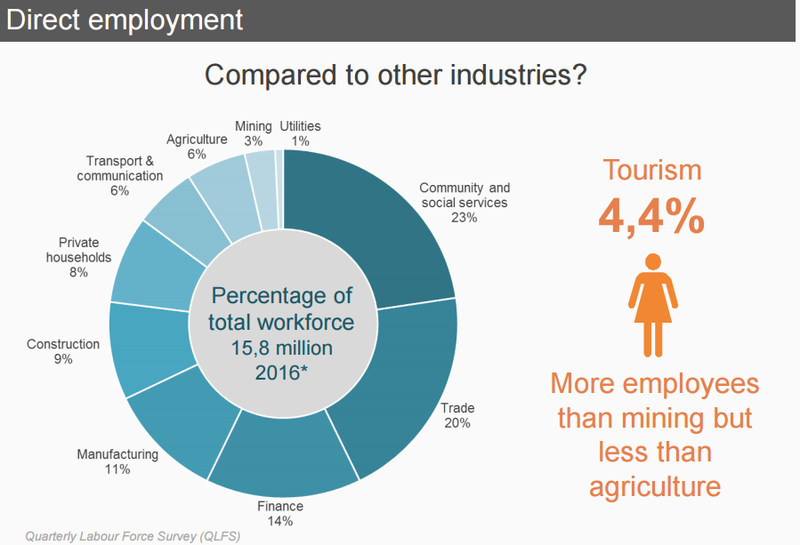 While the tourism industry in South Africa employs a lot of people, as it employs more people than the mining industry in South Africa. It still has a long way to go if it is to become a major employer and assist government in its attempts to reduce unemployment, by it becoming a bigger employer of people in future. In today's update on Tourism statistics in South Africa we focus on the reasons for why European countries' tourists vist South Africa. Is it for business, holiday or to study? The first graphic shows the top 5 countries in terms of percentage of tourists from Europe who are in SA to study. Based on the October 2017 tourism data, 4.3% of visitors from Bosnia-Herzegovnia are here to study. With just under 3% of visitors from Luxembourg coming to SA to study while just over 2.5% of Serbian visitors come to South Africa to study. The next graphic takes a look at the top 5 European countries visitors (in percentage terms) who are in South Africa for business. The graphic below shows the top 5 European countries visitors (in percentage terms) who are in South Africa fro business (note this only reflects October 2017 data). The last graphic will take a look at the top 5 European countries (in percentage terms) whose visitors are in South Africa on holiday. All visitors in October 2017 coming from Andorra, Liechtenstein, Macedonia, Monaco and San Marino came to South Africa for a holiday. Not one of these countries visitors were here on business or for any from of studying/training. For the month of October 2017, 176 969 visitors came to South Africa from Europe. And of that 4 841 were here on business (2.7%), 171 543 were here on holiday (96.9%) and 585 visitors from Europe in October 2017 came to South Africa for studies or training(0.33%). The graphic below shows the number of tourists per month per region from January 2017 to September 2017. For reference and comparison purposes we added the same time periods of 2016 in the graphic. From this graph it is clear the majority of South Africa's inbound tourists come from other African countries. A distant second place goes to Europe, with them contributing around 25% the amount of tourists into South Africa as the African continent. North America comes in a very distant 3rd place with about 6% of the amount of tourists that Africa contributes to South Africa's inbound tourism. 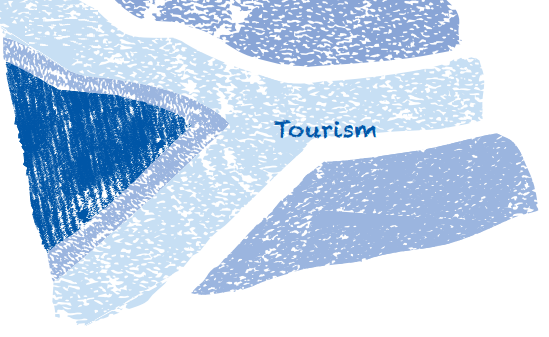 The image below shows a zoomed in version of the graphic above focus on the August and September inbound tourism numbers. Inbound tourists into South Africa per region. The graph below shows the top thirty countries contributing to inbound tourism in South Africa during September 2017. They are ranked in declining order. The top contributor to South Africa's inbound tourism is Zimbabwe with almost 156 000 people entering the country for "tourism", we suspect a whole lot of them become permanent tourist in South Africa with no plan of ever going back to Zimbabwe. For September 2017, Zimbabwean tourists made up 18.7% of all of South Africa's inbound tourists. The following section will take a look at the amount of income generated from various accommodation types across South Africa per year. The income earned is in current prices (i.e inflation has not been removed from the numbers provided). The bar chart below shows the income per year per accommodation type (estimated for 2017 based on available data for 2017). (The bar chart above shows that hotels earn the majority of income from accommodation across South Africa, with caravan parks and camp sites earning by far the least amount of income. Other accommodation types brings in the 2nd most amount of income from accommodation while guest houses and guest farms coming in a distant 3rd place. Worrying for the industry is the fact that growth in income earned from accommodation has not been significant, and this is with inflation included in the numbers reported. If inflation was stripped out of the numbers the growth reported will be even lower. Not good for an industry government is pinning their hopes on to help revive South Africa's ailing economy. A weak Rand helps in making South Africa a cheap holiday destinations for foreigners (particularly those from Europe and North America. Sadly increased crime and targeting of tourists arriving in South Africa is scaring off potential tourists that considered South Africa as a holiday destination. Below the same graphic as above but with inflation stripped out of the income earned. And the difference in the graphics is substantial (look at the value of the left hand axis). From the above it is clear that if inflation is stripped out of the numbers, hotels are actually earning less income (in real terms) now than they did in 2007. In fact their predicted earnings in 2017 is expected to be -5.3% lower than the real earnings in 2007. So what is the difference in the growth in income earned per accommodation type before has been removed and after inflation has been removed? The table below provides that answer. This interactive maps provides more details on South Africa's Tourism sector. The map shows which countries' people visiting South Africa is from. (Note only selected large countries in terms of tourism numbers are highlighted in this graph). Scroll over each country's target icons to get the value for December 2015 and December 2014. If you hover over South Africa you will see the total number of tourists entering our country for both December 2014 and December 2015. Note Map below based on March 2016 data. From the above map it's clear when scrolling over the target icon's that the number of tourists from most of the selected countries have increased significantly from 12 months ago. In total foreign arrivals in South Africa came to 1 320 375 people in April 2016 compared to 1 169 290 in April 2015, an increase of 12,92% , from a year ago. Overseas visitors increased by roughly 44 000 up from 144 771 in March 2015 to 188 491 in March 2016 (an increase of 30.1% from a year ago). Seems the weak Rand is luring foreign visitors to South Africa. At least one small positive coming from our ever weaker exchange rate. So what impact did the VISA regulation changes have on South Africa's inbound tourism industry? We take a look at some of our biggest inbound tourist destinations (excluding African countries) and their monthly tourist visitor numbers before and after the legislation was introduced. The graphic below shows 9 of our major inbound tourism destinations (we tried including a country or two from each continent). The UK is a large contributor to overseas visitors visiting South Africa. And for December 2015 there was a spike in the number of visitors from the UK. We can assume the weak Rand exchange rate vs the British Pound contributed to that spike (as it becomes cheaper for visitors from the UK to visit South Africa. In addition to this the England cricket team touring South Africa surely contributed to this spike in inbound tourists too, as the "BARMY ARMY" flooded into South Africa to support their cricket team. Seems that while there is debate about whether the South African government has in fact revised VISA requirements with regards to unabridged birth certificates. But the numbers above sure tells a story. Based on the latest results from the Tourist and Migration survey foreign travelers arriving in South Africa increased from 1 169 290 in April 2015 to 1 320 375 in April 2016 (an increase of 151 085 inbound tourists) , departures by foreigners increased by 10,2% (from 1 124 179 in April 2015 to 1 238 684 in April 2016), and transits increased by 15,6% (from 55 046 in April 2015 to 63 609 in April 2016). These numbers should make hotel groups such as City Lodge Hotels very happy.